What's Inside each Kombucha Starter Kit? Every Kombucha Starter Kit comes with FREE SHIPPING and is packaged and shipped immediately to preserve freshness. 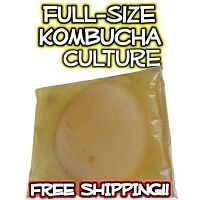 Single SCOBY Culture - one full-sized SCOBY is perfect for a one gallon or smaller batch of Kombucha tea. 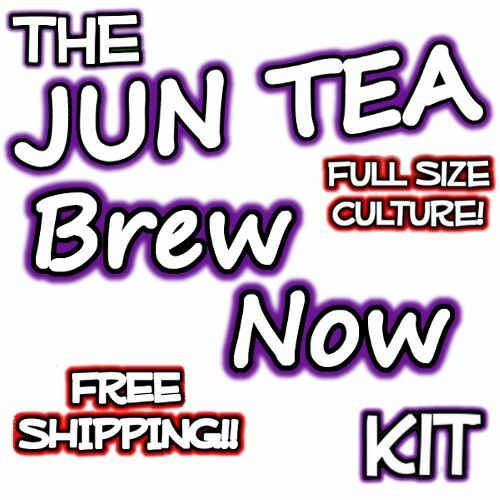 Each culture comes packed in a full cup of strong starter liquid and is guaranteed to brew and reproduce for a lifetime supply if cared for. And we include DIY Kombucha recipes and tips plus Kombucha Mamma Web Support. 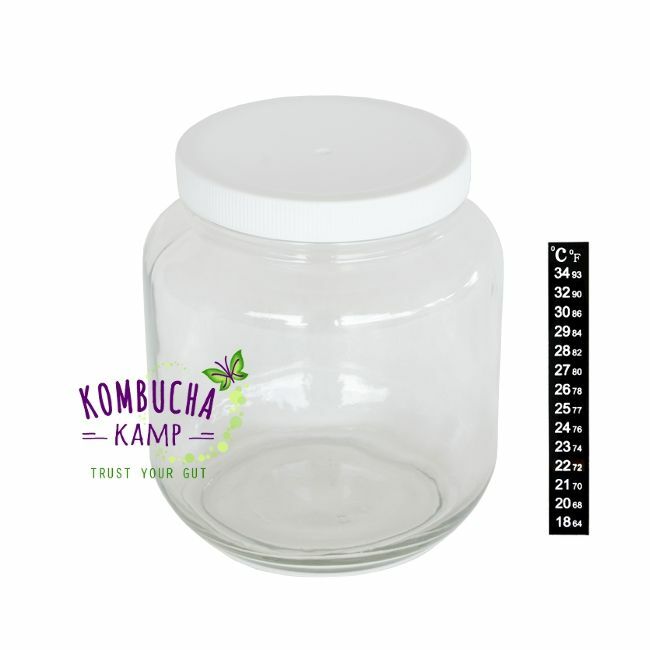 World famous KKamp SCOBYs are the best available! 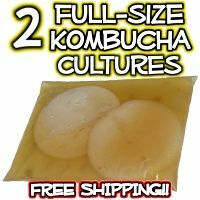 Double SCOBY Culture - whether you want to brew 2 one-gallon batches simultaneously or brew two gallons in Batch or Continuous Brew, each SCOBY comes packed individually and ready to use. 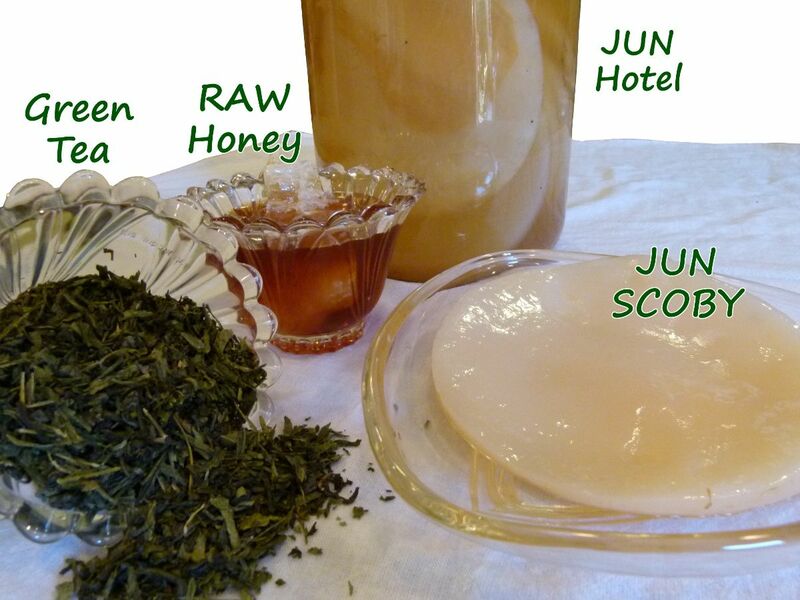 Always use 1 SCOBY and cup of starter liquid per gallon for best results. We include 2 SCOBYs in all our Continuous Brew packages for this reason. The Brew Now Kombucha Mushroom Kit - The Brew Now Kombucha Starter Kit comes with all the basics needed to get started on your brew: a full-sized SCOBY with our exclusive strong starter liquid, cloth cover and rubber band, evaporated cane juice, Hannah's special tea blend, muslin tea bags, our complete printable guide with DIY Kombucha recipes and tips plus Kombucha Mamma Web Support. 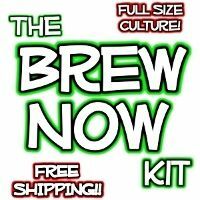 The Kickstarter Kombucha Kit - The Kickstarter Kombucha Starter Kit includes most of the items from our Continuous Brew Complete Package, but without the vessel. 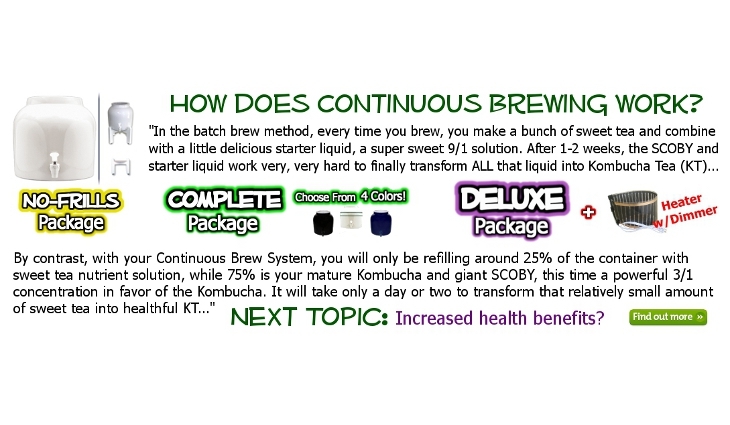 It’s a great option for those looking to start a Continuous Brew but who already have a suitable brewer for Kombucha. With 2 full-sized SCOBYs packed in strong starter liquid, cloth cover and rubber band, evaporated cane juice, Hannah's special tea blend, muslin tea bags, a large tea brewing ball, our 100% organic flavorings, our exclusive 50x Kombucha Concentrate, lab grade pH testing strips, our complete printable guide, DIY Kombucha recipes and tips and Kombucha Mamma Web Support, all you need is your brewing vessel and you're ready to get your 'Booch on. Modern Porcelain Brewing Vessel - a sturdy, economical and Kombucha-safe choice most popular among those new to brewing. Handmade Stoneware Brewing Vessel - these custom made vessels provide ideal conditions for continuous brewing and are made right here in the USA. 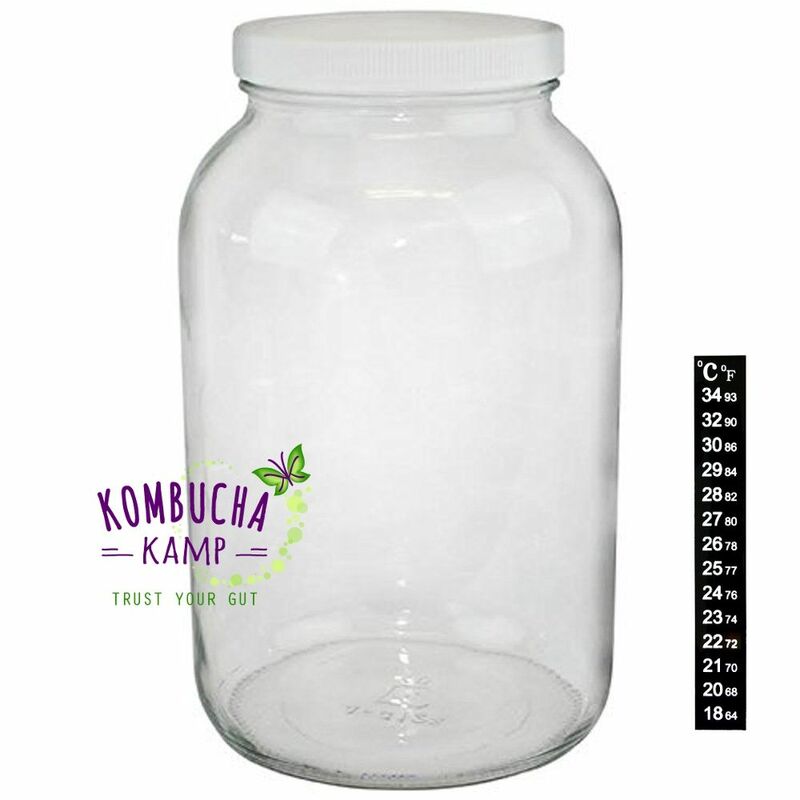 Stainless Steel Brewing Vessel - stainless steel is the only metal suitable for brewing Kombucha and is a popular choice because it is extremely lightweight, durable and stylish. Toasted Oak Barrel - there is nothing like a fermenting in a barrel, because it looks great sitting on the countertop and for the unique flavor it imparts to the brew. Continuous Brewing vs. Batch Brew Method: Which is Better? Safer - Continuous Brewing is safer because the risk of contamination associated with repeated SCOBY handling is greatly reduced. You only need to remove culture for cleaning/re-setting 1-3 times a year on average, meaning the rest of the time the brew and cultures stay protected in their low pH environment. Tastier - Add sweet tea to a sour Continuous Brew base and you can have delicious Kombucha in 1-5 days. The mix of young and old Kombucha in Continuous Brew is preferred by many a homebrewer. With a batch brew, if you get busy and forget to harvest when the flavor is just right, you will have to start again to achieve the flavor, which could take 1-2 weeks or longer. Easier - pouring and refilling your brewing containers using the Batch Brew Method can be messy and cumbersome. With the Continuous Brew Method, just drain from the spigot and add more sweet tea to the top. Or wait and add more sweet tea later if you would like to slow down production. That flexibility makes Continuous Brew the best choice for busy people! 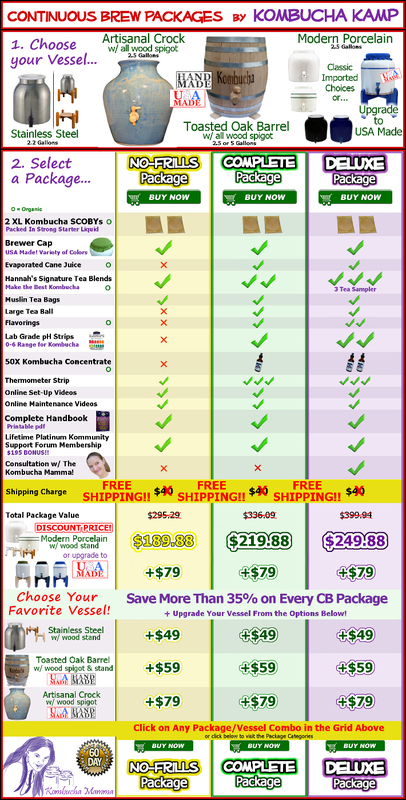 If you’ve already had the pleasure of experiencing the benefits of Kombucha, then you’ve probably already tried some of the commercially-available brands like GT/Synergy only to realize how expensive the habit can be. By brewing your own Kombucha, you save money and create less waste; now that’s a win-win. You control the recipe, so you adjust the Kombucha’s flavor, acidity and even carbonation! Change the amount or type of sugar, vary the tea, try longer or shorter steeping times for the tea, try longer or shorter brewing cycles; every option will affect the flavor and you can decide what works for you. Brewing Kombucha at home is fun and empowering. The Continuous Brew Method streamlines the whole process, reducing the amount of time and energy required and allowing you to focus on the recipe, flavors, bottling and tasting! Don’t…Keep a batch with any sign of mold – once you have mold, throw it out and start over!